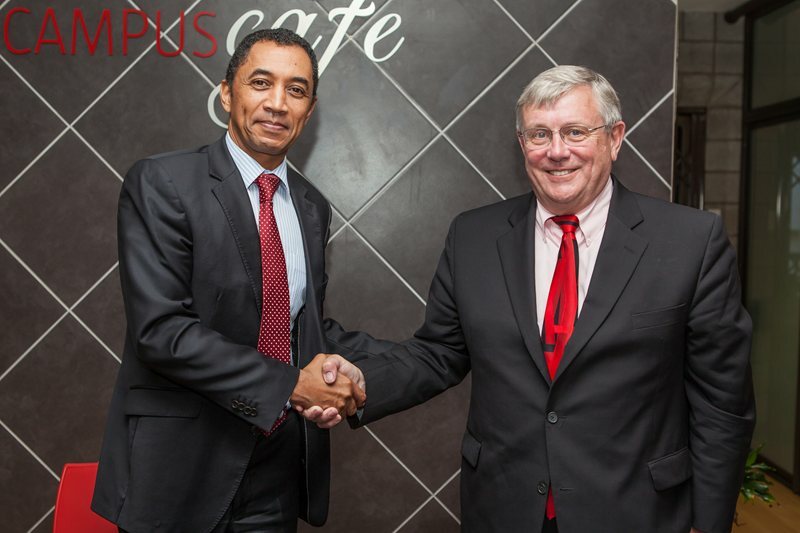 Nelson Mandela Metropolitan University recently renewed its Memorandum of Agreement – for the fourth time – with St Cloud State University, Minnesota, America. St Cloud State is one of NMMU’s oldest university partners with the original MOU being signed in 1997. President of St Cloud State University Earl Potter and Shahzad Ahmad, Director of the Multicultural Centre, travelled to Port Elizabeth to sign the agreement with NMMU Vice-Chancellor Prof Derrick Swartz and Dr Nico Jooste, Senior Director: Office for International Education. The re-signing of the agreement took place along with a general discussion on the current challenges facing Higher Education globally and from a South African and United States perspective. Inter-institutional collaboration was also discussed. Past joint initiatives, over the 15-year span of the partnership, have included student and staff exchange and mobility. To date, St Cloud has sent more than 300 Study Abroad students to NMMU. St Cloud also provided funding from the Bremer Foundation enabling five NMMU students to complete their master’s degrees there. The agreement also facilitates visits to St Cloud by a number of NMMU professional staff as part of their development. The partnership has included joint work on student success studies, academic exchanges in a variety of fields and numerous benchmarking exercises. NMMU and St Cloud State University have also, in the past, presented papers at three different international conferences as to the benefits of the partnership between the institutions. Prof Derrick Swartz, Vice-Chancellor of Nelson Mandela Metropolitan University (left) and President Earl Potter, President of St Cloud State University.